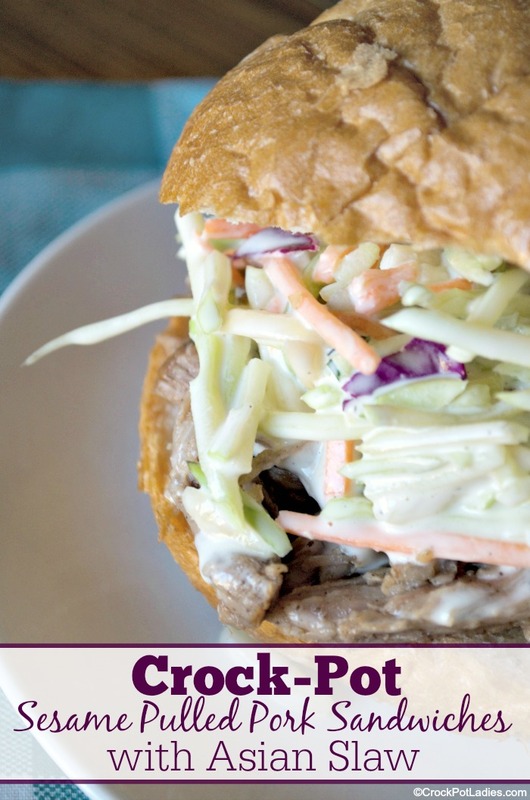 East meets west with this delicious recipe for Crock-Pot Sesame Pulled Pork Sandwiches with Asian Slaw. 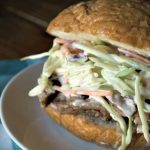 Tender pulled pork is simmered in a lovely Asian inspired sauce and served on rolls with a crispy homemade Asian coleslaw! Today is “East Meets West Day” which immediately had me thinking “what Asian inspired dish can I make in the crock-pot?” Surprisingly, a Google search turned up a few recipe ideas but I found this recipe at Eat My Charlotte and felt I had to give it a try. We are definitely fans of pulled pork sandwiches but the addition of an Asian flavor with the sesame oil and rice wine vinegar plus the broccoli slaw, made this a unique dish. I did change it up a little and I am sure my pictures don’t do it justice but my family was definitely asking for seconds on this one…in some cases thirds. A lovely Asian inspired pulled pork recipe that is served on buns topped with a crunchy Asian inspired coleslaw. A perfect pairing and a great dinner! 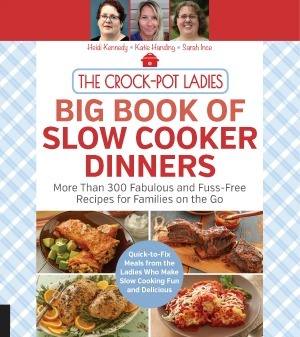 Place pork roast in the bottom of a 6 quart slow cooker. In a medium sized mixing bowl, combine soy sauce, garlic, sugar, honey, oil and ginger. Stirring well. Pour mixture over pork. Cover and cook on LOW for 2 hours. Remove lid, flip pork over, cover and continue cooking for an additional 2 to 3 hours on LOW until the pork is cooked through and can easily be shredded. Remove pork from slow cooker and place on a plate and shred the meat with two forks. Add shredded pork back into the slow cooker and toss in the cooking liquid in the slow cooker. Recover and allow the pork to cook for 1 hour on LOW. Set slow cooker the the WARM setting to keep meat warm before serving. Just before serving, add the sesame seeds and stir well to distribute them throughout the pork. 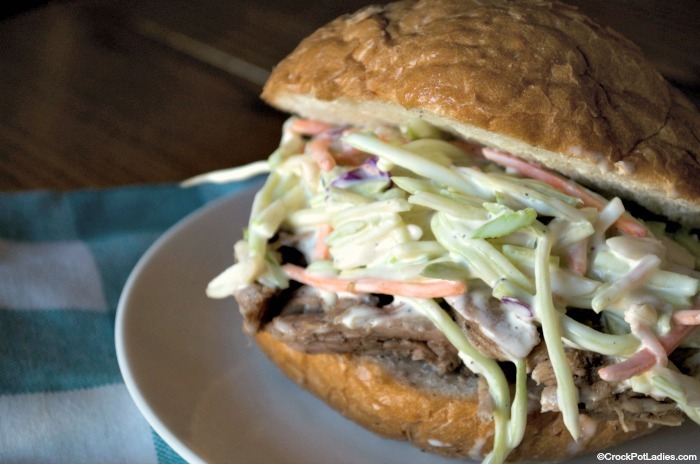 Serve on toasted buns (gluten free if on a GF diet) with Asian Slaw if desired. In a large bowl, combine all ingredients for the slaw and stir well to mix. Cover bowl and refrigerate for at least 1 hour to allow the flavors to combine. Linked up at Full Plate Thursdays and It’s a Keeper! Thank you for hosting today! I shared one of our favorite burger recipes, Mouthwatering Cheddar Burgers with Caramelized Onions, Bacon and Sauce. Have a great week! This is an awesome recipe that we would really enjoy, I love the broccoli slaw. Hope you have a great week end and thank you so much for sharing with Full Plate Thursday. Thanks Helen! Hope you try it out. Have a wonderful weekend. Question for you Tara, is the Rice Wine vinegar supposed to go in the pulled pork too? I have a friend trying this awesome recipe today. ha! Good catch, I copied the ingredient list from the blog I found the recipe on and they did list rice wine vinegar in the ingredients but never listed it in the instructions for the pork. So I did not put any in my pork. Forgot to go back and fix the ingredients after i was cooking. I’m thinking you don’t need to or want to put rice wine vinegar in the pork. Off to fix the recipe now! You can find broccoli slaw in your produce section near the pre-packaged salad mixes. It is just the broccoli and other veggies and you can add your own favorite dressing. I don’t what happened, but something went epically wrong. I doubled the recipe because of the size of my pork roast, and it is so ridiculously salty, almost inedible. I’ve added so much honey to it to try to sweeten it a bit, but it’s not helping enough. I think my mistake was to prep the night before and put the crock into the fridge so I could just turn it on in the morning. I wonder if the marinating effect caused it to be so salty? I am sorry your dish came out so salty. I have made this recipe several times now and have never had it come out overtly salty, but I also have not marinated the pork overnight, although I am not really sure why that would make it salty. There is a chance that you purchased a pork roast that had added salt added to it. What I would suggest the next time is to try using either a low sodium soy sauce or 1/2 a cup instead of a full cup of regular sodium soy sauce.